The first presentation I actually made it to was Steven A. King on the great Rube Waddell Straw hat Controversy of 1905. The common wisdom story of Waddell is that he couldn’t pitch in the 1905 World Series because he hurt his arm in a fight with another player over a straw hat. This is about as plausible as the fact that Babe Ruth ate too many hot dogs, resulting in the “bellyache heard round the world.” (It’s more likely Ruth had syphilis.) What is not known is whether Waddell’s mystery injury was a true injury and the straw hat story was a cover for the true nature of it, or if the straw hat story was covering up the fact that Waddell had possibly been bought off by gamblers. OK, maybe I was just amused that people can be outraged over the reputation of a player who has been dead for 99 years. I spent too much time wandering around in the vendor room, so I missed Dan Levitt’s presentation about the Federal League. Alas–I’ll have to read Dan’s book on the subject instead. (It’s The Battle that Forged Modern Baseball: The Federal League Challenge and Its Legacy and that link is to Amazon, btw.) The next one I made it to was “A Probabilistic Approach to Measuring the Excitement of Baseball Games” by Michael Freiman. This is one of those presentations that is uniquely SABR-ish. I know some who would criticize the basic effort in trying to quantify the unmeasurable. Excitement? Do we actually need to measure that? But those folks miss the point. Making metrics is one way to dig deeper into the mechanisms of the game. In this case Freiman is digging not only into the mechanisms of the game, but into one key component of the spectator experience, which is our expectation or rooting for a win or a loss. He proceeded to give a top 20 list of the most exciting games in postseason history, which were mostly game 6 or 7 of the World Series, but one NLCS entry did make it: NLCS Game 5 in 1980, “possibly most exciting postseason game on a per inning basis ever.” He also looked at some specific historic moments like Bobby Thomson’s “shot heard ’round the world.” When it comes to “winner take all” games it is the 17th best of all time. He describe that traditionally, marker motion capture systems put a person into a Spandex suit with little reflective balls attached to it. (If you’ve seen the Lord of the Rings DVD extras, you see a lot of Andy Serkis wearing one.) To make the Tiger Woods golf video game, they put Tiger Woods in the suit and built his avatar on that. Eckstein went on to show how with a six-camera setup you can model the human body completely in 3D, which is the setup NOW being used to make games like Halo 4 and most Hollywood animation. But that system can’t be used in baseball because it doesn’t capture enough frames per second, and the focal length of the cameras is only 8-14 feet. “How can we track a player in a game situation and report on the biomechanics of his motion?” he asked. Enter Kinatrax and their new high speed cameras, which have a “split architecture, traditional sensor design, has fps speed needed, and good data transfer rate. We have matched these with new telephoto lenses.” Judging from his slides, the entire camera is fairly tiny, with a large lens on it. They’re working with the Mets now to implement the system as their first MLB partner. They figured out where in Citi Field to put all the cameras. The idea is that they can rack up tons of data on a pitcher and identify a baseline of when he’s at his best. What does he look like when all his pitches are working? What’s the comparative biomechanics over the course of a pitcher’s career. Does his motion change based on situation? And can you identify early when an injury or a breakdown is imminent? 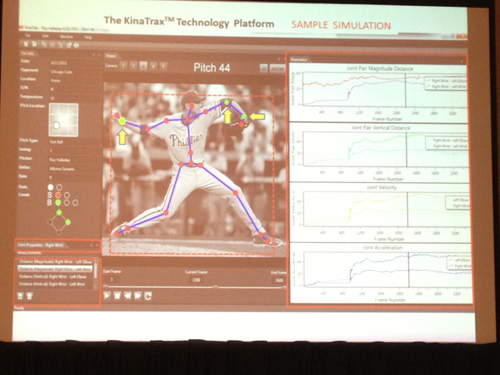 Kinatax should have a full public proof of concept demo to present at SABR Analytics in 2014 in Arizona. That means they generate 8-10 terabytes of information every game. They’re working with Microsoft and it’s all stored in the cloud. The data isn’t ready for viewing until 10 hours after the game. Not yet able to zoom in on grip, pitcher position on the fingers on the ball, not there yet. Maybe someday. Email meckstein@kinatrax.com if you want a copy of the presentation. There were also two major panels today, the player panel with Dickie Noles, Gary Matthews, and Brad Lidge, and the Women in Baseball panel, which featured the fantastic, legendary Perry Barber (the woman who came closest to umpiring a big league game), Salty Ferguson (who played with the Rockford Peaches of the AAGPBL), Susan Ingersoll Papaneri (from the Phillies front office), and Kristin Mills Caldwell, and moderated by Robin Wallace, both of whom played for the Team USA women’s baseball team. 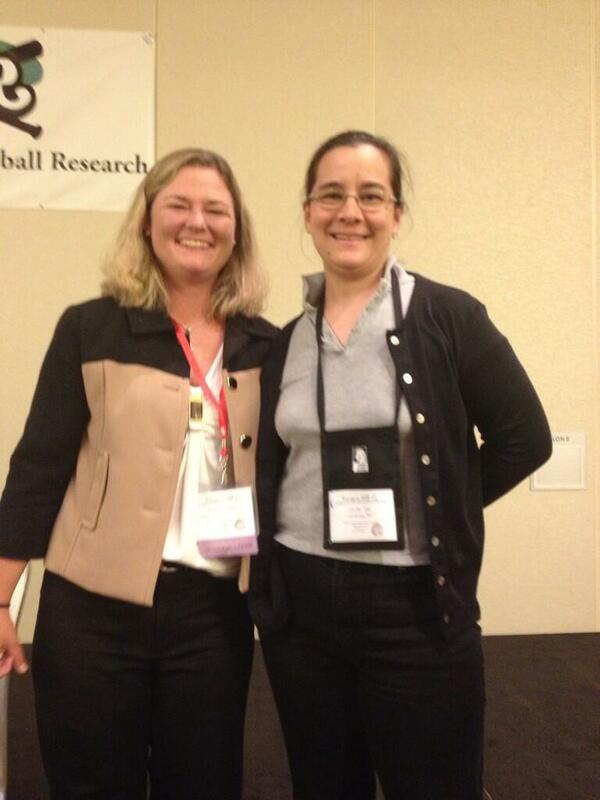 And Robin, by the way, is the woman who taught me to throw a baseball correctly, at the very first New England Women’s Baseball League practice/tryout I went to. This was written by Cecilia Tan. Posted on Thursday, August 1, 2013, at 10:47 pm. Filed under Baseball Musings, SABR. Tagged brad lidge, dickie noles, gary matthews, SABR, women's baseball. Bookmark the permalink. Follow comments here with the RSS feed. Post a comment or leave a trackback.